The holidays are finally over! Vegans probably fared better than omnivores. We didn’t eat the greasy, cheesy, hors d’oeuvres at holiday parties. And we easily abstained from all the buttery, dairy-rich cookies, cakes, candies, and pastries that appeared every day in our break rooms at work. Still, in our holiday feasting we may have over-indulged in cashew “cheezes”, comfort food casseroles, and vegan sweets. Even if we haven’t been overly indulging – if there’s one thing I know about vegans it is that we like to EAT! And with the New Year many of us are resolving to shake up our diet a little – whether that means eating more fruit, drinking more water, doing a juice fast, or eating lower-fat or lower-cal. So for the next few Well-Read Wednesdays, I’m reviewing a few cookbooks that focus on eating lighter. 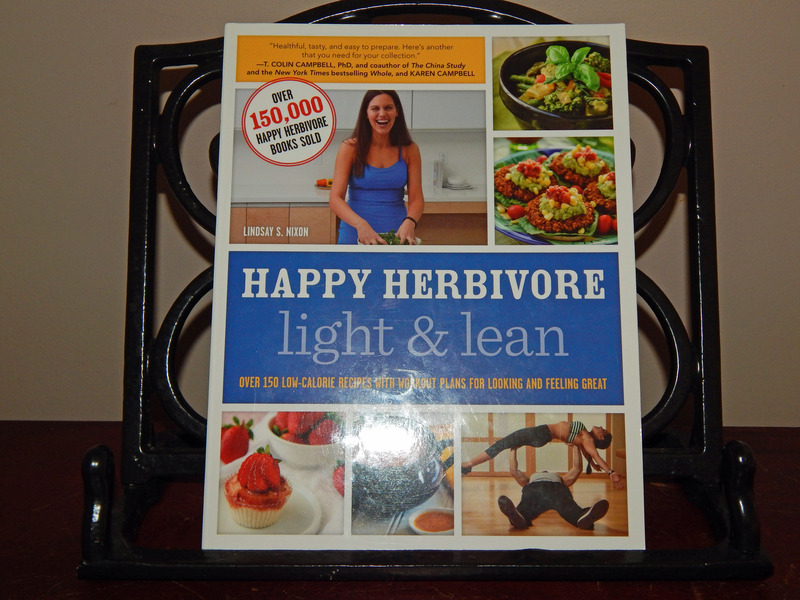 First up: Happy Herbivore Light & Lean: Over 150 Low-Cal Recipes with Workout Plans for Looking and Feeling Great, by Lindsay S. Nixon. Easy recipes for beginning cooks. Ordinary, everyday ingredients – that you probably have in your kitchen or, if not, can easily purchase at your corner grocery store. Quick – Most recipes come together in 30 minutes or less. Inexpensive – Many recipes cost $5 or less to make. Low fat or no fat recipes. Gorgeous, full-color pictures of most recipes. And, of course, there’s Lindsay herself, who is just so darn cute. You can’t help but like this girl. She’s just so open, so honest, so relatable – so much like us! This is no vegan princess or elite member of the Vegan Police. In Light & Lean, she’s very open about her previous weight problems and gym addiction. New to this book is a complete nutritional breakdown for each recipe – calories, fat, carbs, sugars, proteins, and Weight Watcher points. And for those who are really into counting calories, there’s an index in front breaking all the recipes down by calorie count – from 25 calories or less per serving, to 350 calories per serving. The book covers a lot of territory – Breakfast, Muffins, & Breads; Sandwiches, Tacos, & More; Hearty Burgers, Bowls, & Wraps; Soups, Stews, & Savory Pies; Salads and Dressings; Pasta, Stir-Fries, & Noodles; Satisfying Sides; Dips, Snacks, & Appetizers; Desserts; Drinks (including alcoholic);and Do-It-Yourself (condiments, spice blends, etc.). As with all Happy Herbivore books, there are a number of basic recipes (one reason these books are so good for beginners) but also a couple of truly creative ones. The recipe for savory Olive Gravy, served over biscuits for breakfast, is one I can’t wait to try. There’s a short segment on exercise at the end of the book. To me it didn’t add anything, but Lindsay fans might find it interesting. But some recipes make many more servings. Mixed in with all the single-serving soup recipes you will find Carol’s Cabbage Soup which makes sixteen servings! And serving sizes can be strange. A serving of Zucchini “Mozzarella” Sticks has only 21 calories – but look closer and you’ll see that the serving size is only one stick! Realistically, this recipe will not serve 24 – it may serve two. So, if you’re tracking calories (or fat, carbs, WW points, etc.) and relying on the nutritional analysis provided, you’ll need to dig out that calculator again. Many recipes are “non-recipes.” There’s a recipe for a Classic Veggie Wrap – “Slather hummus on wrap. Add onion, cucumber, shredded carrot, and tomato slices, plus a sprinkling of fresh black pepper if desired. Roll up and enjoy!” Game Day Loaded Potato – a baked potato topped with canned or leftover chili. Butternut Soup – butternut squash, vegetable broth, curry powder. Yellow Curry Dal – yellow split peas, vegetable broth, curry powder. Carrot Soup provides a little variety – carrots, vegetable broth, curry powder, an apple, and nondairy milk. Beginning Cooks: If you’re a newbie vegan cook and typically cook for just 1-2 people, this is an ideal book for you. You’ll enjoy keeping this on hand for quick and easy recipes and meal ideas. Intermediate/Experienced Cooks: Unless you are a huge Happy Herbivore fan, this is probably not a book you want in your permanent collection. If you’re curious, check it out from the library. Thanks – that was a really helpful review. I had seen it advertised and wondered if I might be interested. Thanks, Debbie! I’m glad it was helpful!